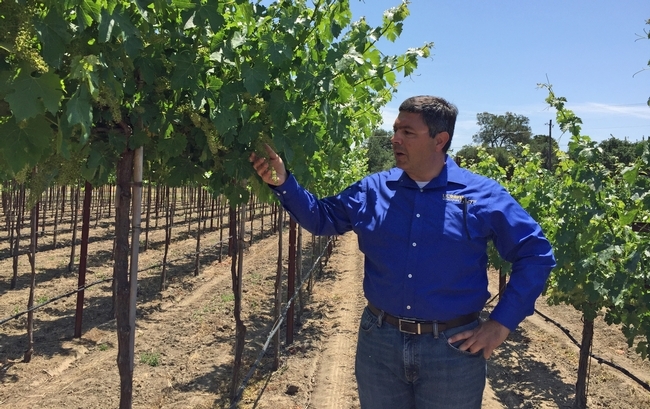 Labor costs about 7 cents per vine for managing the “touchless” vineyard, compared to $1 in the conventional vineyard, says Kaan Kurtural, UC Cooperative Extension specialist. Will machines replace the romance of the hand-cultivated wine grape vineyard? A “touchless” vineyard was among the latest research on labor shortages, weeds and pest management by UC Cooperative Extension scientists discussed at Grape Day at the UC Davis Oakville Station, located in the epicenter of California wine country, on June 6. 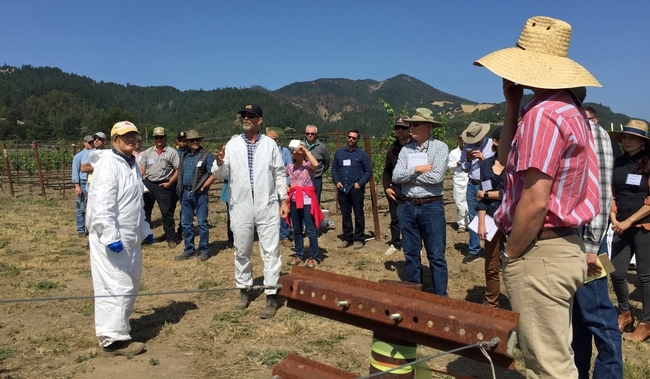 About 200 wine grape growers, vineyard consultants and other industry people attended to learn about the latest UC Cooperative Extension research. Vineyard managers from boutique wineries such as Fork in the Road to Pine Ridge Vineyards to the Fortune 500 wine company Constellation Brands gathered at the research station's experimental vineyard. 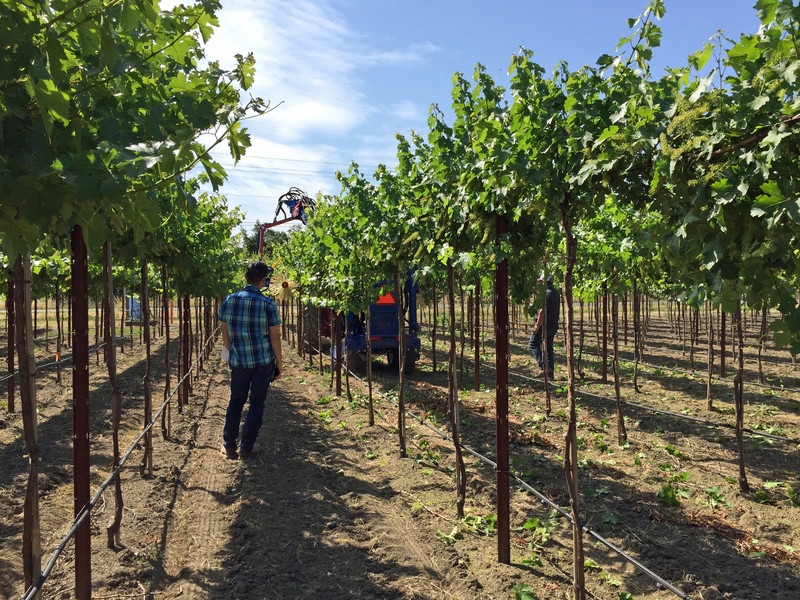 Several vineyard equipment representatives brought their machines to the field to demonstrate their weeding, pruning and canopy management capabilities. This three-row sprayer was one of four tractor attachments presented. To help growers attract and retain farm workers, Monica Cooper, UC Cooperative Extension advisor for Napa County and her research assistant, Malcolm Hobbs, are conducting a survey of agricultural workers to determine the factors that affect job satisfaction. They found the number of female workers in Napa County has increased rapidly since 2013. “Women may be moving into the labor pool to fill vacancies caused by the decline in the number of male workers migrating to the U.S. for agricultural work,” Cooper said. They plan to provide participating companies with custom recommendations for recruiting and retaining workers. To help growers reduce their need for hand labor, UC Cooperative Extension viticulture specialist Kaan Kurtural designed a “touchless” demonstration vineyard that is mechanically managed. 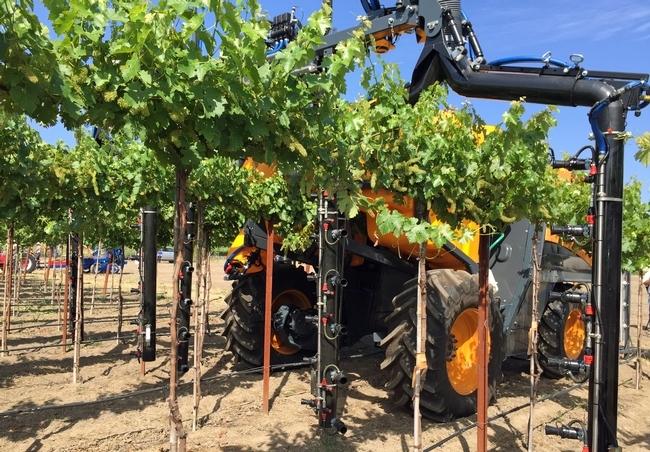 The mechanized vineyard is one of six trellis systems he is studying for water use, nitrogen use efficiency, yield and fruit quality of the wine grapes. The touchless vineyard experiment started out as a demonstration at first, but with grower interest, it turned into a full-blown research project. “It started as way of saving labor costs, but when we started looking at the physiological aspects of how these plants grow, we saw the benefits from the quality point of view in addition to the labor savings,” said Kurtural, who is based in the Department of Viticulture and Enology at UC Davis. A traditional vineyard in the Napa area is about a meter or 36 inches above the vineyard floor with vertical shoots held up with wires, which are moved by hand. “We said, ‘Why don't we turn the system upside down?' 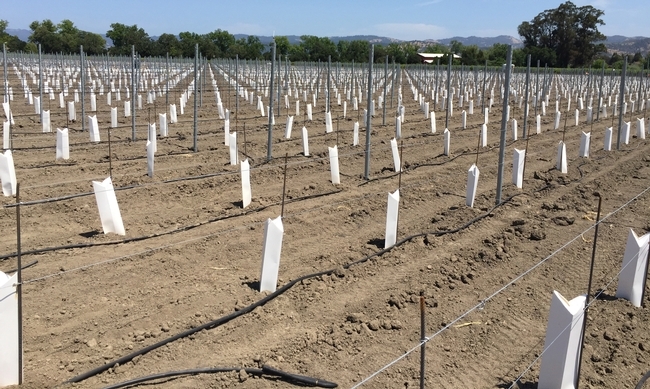 Grow a tall trunk then put the bilateral cordon about 62 inches above the vineyard floor, that way we can push the rows a lot closer,” said Kurtural, who oversees the 40-acre Oakville experimental vineyard. The leaves grow down to generate the same leaf area as a traditional vineyard, but the leaves in the mechanized vineyard use water more efficiently so the no-touch vineyard requires less water compared to traditional vineyard systems. “This is a dense system, this is 1.5 meters by 2 meters, roughly 1,340 plants per acre – we're getting by here on a third to quarter acre foot of water,” Kurtural said. Mechanically removing shoots opens up the canopy to allow more sunlight in. The conventional system yields up to 5 to 6 tons per acre whereas the mechanized vineyard yields 7 to 8 tons per acre. “These clusters set far fewer berries than a traditionally managed vineyard, but the berry size is also very small, which is what the winemakers like,” he said. During harvest, grapes picked by machine are sorted on board the harvester so they go into the winery in uniform sizes, whereas hand-harvested grapes have to be sorted on a tray before they are put into the press tank. This machine cuts weeds at 1 to 2 inches below the soil surface. John Roncoroni, UCCE weed science farm advisor in Napa County, discussed options for weed control among young grape vines. In the past, many vineyards were fumigated before planting for disease control, but it also provided weed control for young vines. 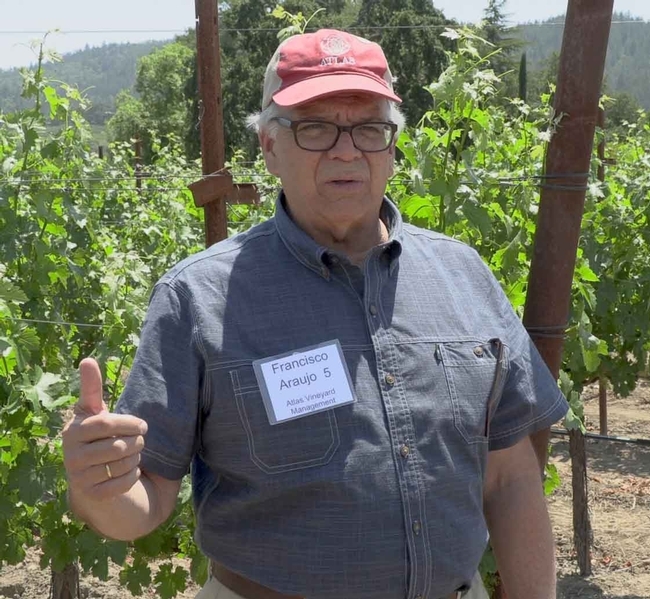 Cartons protect young vines, but “herbicide use on vines less than 3 years old is a risky endeavor,” John Roncoroni cautions. Covers on young vines allow the use of many post-emergence herbicides to control weeds, but Roncoroni cautioned that application of post-emergence herbicides on vines that aren't protected by mature bark may damage or even kill the vine. Lynn Wunderlich, UC Cooperative Extension advisor for the Central Sierra, and Franz Niederholzer, UC Cooperative Extension advisor for Colusa, Sutter and Yuba counties, demonstrated how to calibrate sprayers and to get uniform coverage when spraying fungicides. 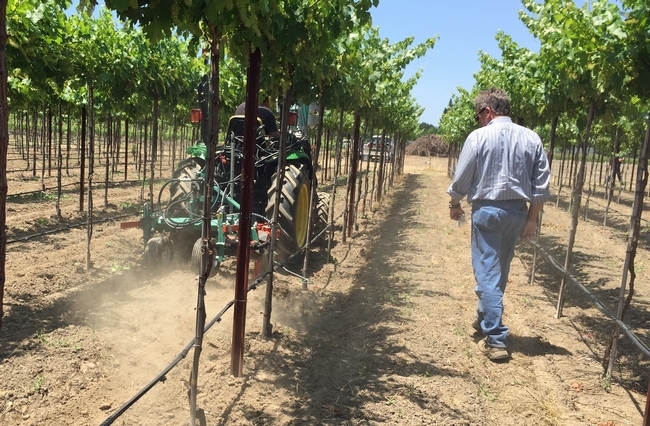 To test spray uniformity, use wettable powder or water sensitive paper on vines, recommend UC Cooperative Extension advisors Lynn Wunderlich and Franz Niederholzer. In 2016, UC Davis researchers identified the three-cornered alfalfa hopper, Spissistilus festinus, as a vector of grapevine red blotch virus. Cindy Preto, a Ph.D candidate in the UC Davis Department of Entomology who is assisting UC scientists studying the three-cornered alfalfa hopper's biology and host plants, provided an update on their research.